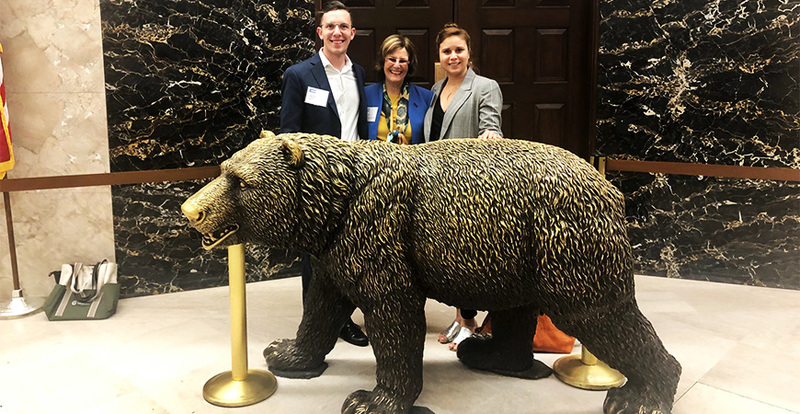 Ph.D. students Craig Ennis and Vicky Espinoza visited Sacramento with Vice Provost and Graduate Dean Marjorie Zatz to speak with lawmakers about the contribution of graduate research to California's development. Two UC Merced Ph.D. students took to the State Capitol yesterday with representatives from the other UC campuses to advocate for the importance of the research being done across California. Craig Ennis and Vicky Espinoza were accompanied by Vice Provost and Graduate Dean Marjorie Zatz to meet with state leaders during the UC’s 10th annual Graduate Research Advocacy Day. They met with assembly members Frank Bigelow (R-Madera) and Rudy Salas Jr. (D-Bakersfield) and Senator Andreas Borgeas (R-Fresno), as well as representatives from the offices of assembly members Heath Flora (R-Ripon), Joaquin Arambula (D-Delano) and Adam Gray (D-Merced) and senators Anna Caballero (D-Merced) and Melissa Hurtado (D-Sanger). Craig Ennis' research seeks to better understand the resistance properties of fungal biofilms. In Sacramento, the Burbank native discussed the importance of his dissertation research on biofilms — microbial communities that stick to surfaces. Think grime that builds up in a toilet bowl, scum on the top of a lake or plaque on teeth. Ennis was drawn to biofilms because the infections they cause are often resistant to drug treatment. The National Institutes of Health estimates that 80 percent of infections are caused by biofilms, so they can pose huge health risks. Ennis explained there are other risks to consider. “In agriculture, biofilms also pose a serious issue because they clog waterways that supply water to livestock and reservoirs, which then can infect livestock,” he said. 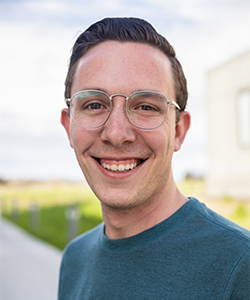 Ennis earned bachelor’s degrees in biological sciences and psychology from UC Merced in 2016. As an undergraduate, he worked in microbiology Professor Clarissa Nobile’s lab and continues his graduate research there. “I’m honored to share the importance of my research and create a greater understanding of the problems at hand and help find ways to solve these issues,” he said. I’m honored to share the importance of my research and create a greater understanding of the problems at hand and help find ways to solve these issues. Vicky Espinoza's research addresses water management and global food security. Espinoza, a second-year Ph.D. student in Environmental Systems in engineering Professor Joshua Viers’ lab, researches water management and its implications on global food security. She focuses on the San Joaquin Valley, including 255 identified disadvantaged communities, where more than 10 percent of agriculture land is slated to be removed from production within the next 10 years to sustain water resources under the Sustainable Groundwater Management Act. Espinoza was involved in writing the San Joaquin Valley section of the Fourth California Climate Change Assessment, which was presented at last year’s 2018 Global Climate Action Summit. For the Los Angeles native, sitting down with lawmakers during Graduate Research Advocacy Day was another important step in furthering understanding of the issues. 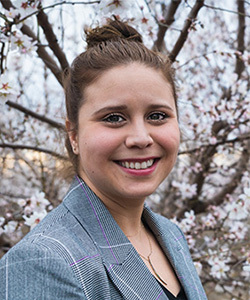 Immediately after the advocacy day, Espinoza headed to Washington, D.C., to talk to more policy makers and stakeholders at the Chicago Council on Global Affairs' Global Food Security Symposium about her research.